I’ve been working on my Tree of Life quilt. The other day I showed you my second start at it. The first go was … worthy of trying. But it wasn’t working out for me. I count it as a successful experiment, one from which I learned a lot. The black strips in the picture above are attached now. That border took the finished size to 30″ x 36″. Those dimensions work well for a block border of 6″ blocks. Of course there are a lot of other ways to solve that problem, too. I imagined the next border as an enclosure of variable stars with pale backgrounds, and centers and points of the same blues, greens, browns, and reds. With 6 blocks on each of the longer sides, 5 blocks on each of the shorter sides, and 1 in each corner, I needed 26 blocks. I wanted the backgrounds scrappy, too. Checking scraps first, I found pale golds and pale greens for backgrounds. I cut so there were an equal number of warm backgrounds as cool. I also cut points and centers with equal numbers of warm and cool. This technique works well for me when a quilt doesn’t naturally tilt to one side or the other. After building 13 of the 26 blocks, I put them on my design wall around the center. Scary! They were so wild, so vibrant, I was afraid they would take over, overwhelming the beautiful center. I hollered at Jim to take a look. “Looks like a celebration!” he said. We talked through my concerns, but that’s what I want — a celebration. So we agreed I should go ahead. “Trust the process. Trust the process,” I kept muttering to myself the next day as I finished making those stars. “The process” is the process of experimentation, of taking a vision to its point of evident success or failure. I figured there was nothing lost by continuing to make blocks. If they wouldn’t work, I’d have 26 great blocks available for a different project. And here is the work so far. Finishing at 42″ x 48″, it’s ready for another 1″ black line all the way around. After that will come its final borders, to finish at about 56″ x 62″. I like that the star backgrounds are paler than the pale caramel in the sawtooth border. The value contrast helps keep the focus on the center, rather than mushing it all out into a sea of mediums. I trusted the process. I continued with my stars, knowing that I might not use them. But that lack of confidence did not stop me. Don’t let it stop you, either. Trust the process. Experiment. No bad thing will happen. Trust me. 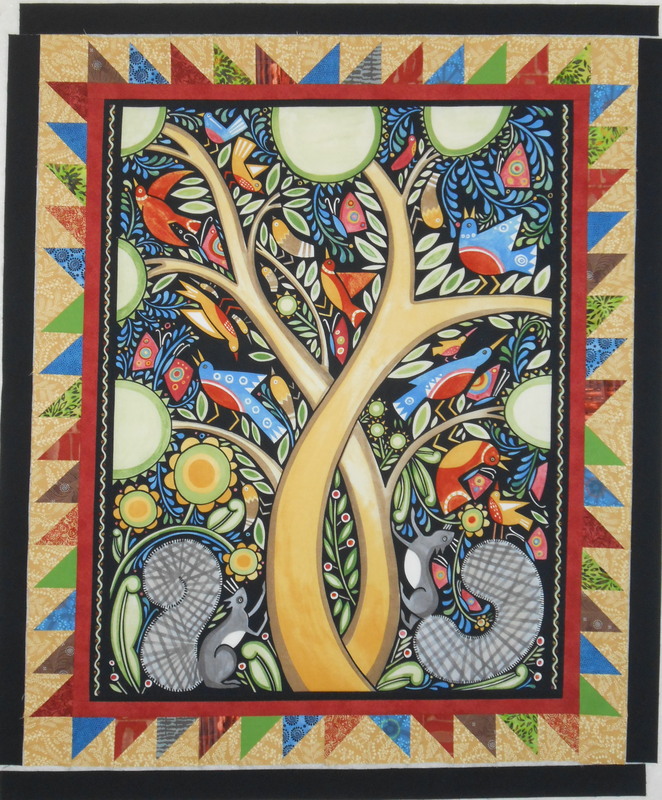 This entry was posted in Creativity, Quilting, Quilts and tagged Borders, Center medallion, Color, Creativity, Design, Design-As-You-Go, Experiment, Julie Paschkis, Medallion quilts, Power, Process, Progress, Solving problems, Tree of Life, Trust, Value on February 24, 2015 by Melanie McNeil. The Tree of Life is an old motif, dating back thousands of years in religion and philosophy, and hundreds of years to textiles from India. 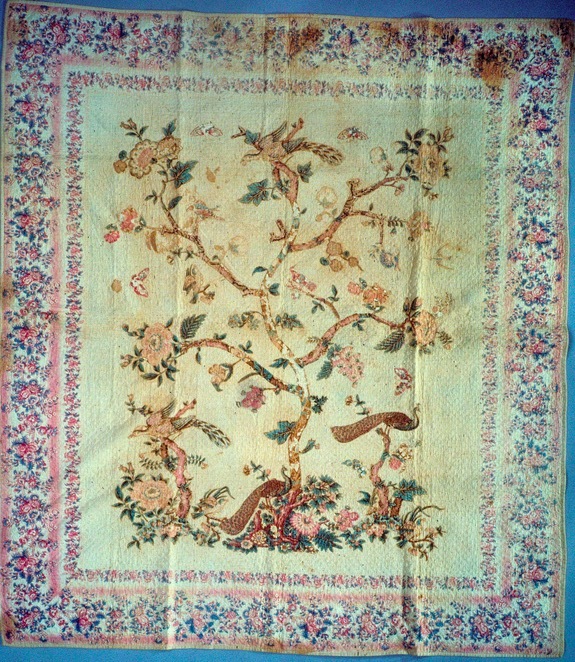 This quilt from the Smithsonian collection dates to around 1840. It was appliqued in the Broderie Perse style, popular at the time. A couple of years ago on an outing with my quilting small group, I was lucky to find a panel printed with a Tree of Life motif. It was designed by artist/illustrator Julie Paschkis. In fall 2013 I began a quilt with it, but I got bogged down with other projects and didn’t get very far. Still it called to me to come back, try again. With my initial start, I created and attached side borders. I also made a bottom border of a completely different nature. My intention was to applique the first border on the top. But last week as I analyzed the work, I felt increasingly uncomfortable. Asymmetrical borders don’t bother me at all. But I was intending to have 3 vastly different kinds of borders on 4 sides. They just didn’t seem cohesive, and the sizing would have been a problem, too. Ultimately I removed the side borders and began again. This time I could visualize almost the whole quilt without struggle. Colors still confuse me some, but they will resolve as I proceed. This is what I have so far. The second border is of half-square triangles, using pale caramel as the background color. This creates value contrast with the black-backgrounded center, but uses a color that appears in the tree and branches. While all 4 sides are the same width, I’ve maintained the non-square rectangle of the panel. I also set the triangles asymmetrically to keep the light-hearted tone of the panel. You see black strips around that, which are not attached yet. They’ll create a narrow border, allowing an edge and repetition of the center’s black. And after that… you’ll need to wait and see! I struggled with this project before and set it aside. Deciding to unstitch and restart was a good decision, and I’m having fun with it now. 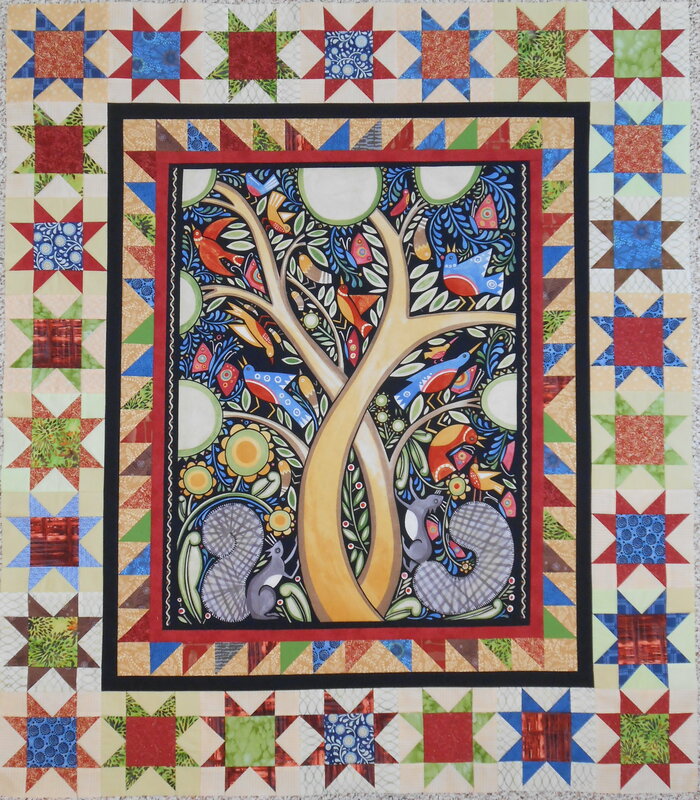 This entry was posted in Creativity, Quilting, Quilts and tagged Borders, Center medallion, Color, Creativity, Design, Design-As-You-Go, Julie Paschkis, Medallion quilts, Process, Progress, Solving problems, Tree of Life, Value on February 19, 2015 by Melanie McNeil. Worse things have happened. I cut 34 squares the wrong size. Rather than 1 3/4″, I cut them 1 7/8″. Generally it’s better to cut things too large than too small, right? After all, if they are too large, you can trim them to size. But since they are already small, and the trimming would be only 1/8″, I decided to cut whole new squares. Trimming seemed just too fiddly. The lucky part was I had plenty of fabric to do so. I’m making parts for a small class sample. I’ll be teaching a beginners’ medallion class, which starts in October. The class project will teach five different blocks, including the flying geese used in the variable star. It’s a change-up from the standard sampler that many beginners’ classes teach. Of course for a beginners’ class, my design is purposely very simple, using only six fabrics. This is the design I’m using with solid fabrics. The sample is another experiment. Generally, medallion quilts don’t use a background fabric, the way the grey serves in this. 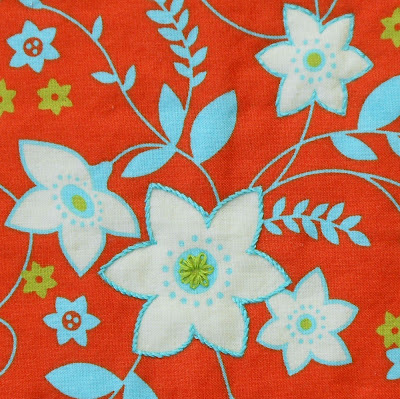 But modern quilts use a lot of negative space, and modern medallions tend to have more of a background feel to them. Take a look at the Aviatrix medallion here. The pale grey is used from center to outer borders, and I think it is effectively done. Here are the parts I have so far. The grey is a little dark for my taste. That merits a big “oh well.” I think it will be very pretty when done and certainly will serve well as a sample. Up for tomorrow: make the half-square triangles and assemble the top. And other projects await, as well! But I’m making progress. This entry was posted in Creativity, Quilting, Quilts and tagged Center medallion, Color, EQ7, Experiment, Medallion quilts, Process, Progress, teaching, to-do list on August 22, 2014 by Melanie McNeil. Every year my local quilt guild has a challenge quilt. 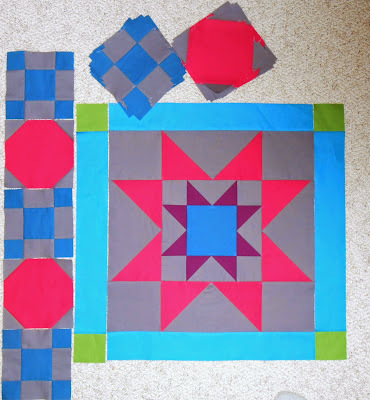 Those participating bring the finished quilts to our last meeting of the guild year in July. 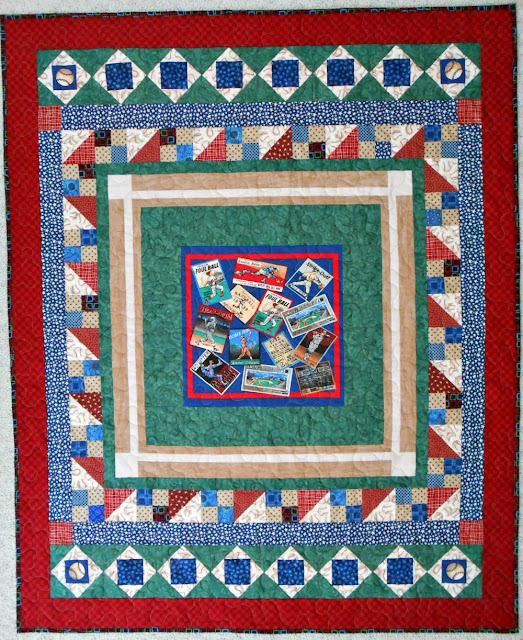 This year’s challenge was to do a miniature quilt, no more than 18″ on each side. The other constraint was it had to be a real quilt with three layers, quilted, bound, and labeled. There were so many wonderful entries. My regret is I didn’t take pictures. 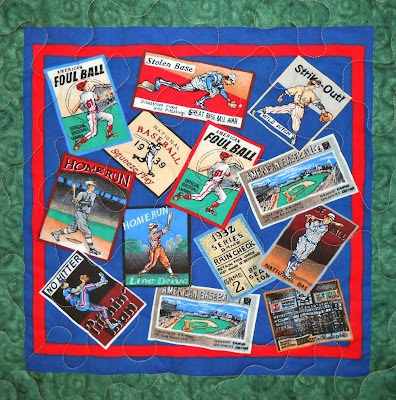 The quilts included art quilts and wall-hangings, block format quilts, and medallions. 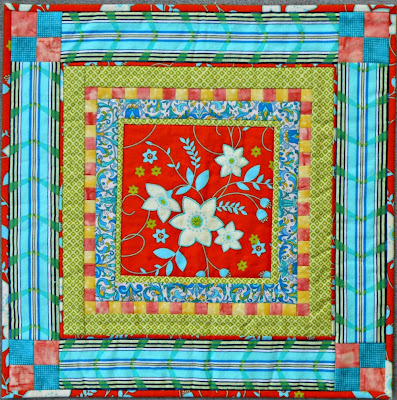 My small group did a round robin to make medallion quilts for the challenge, and several of them were entered. I brought two quilts. One was my round robin, and the other was made only by me. Friendship Star round robin quilt. I made the center star block. Barb added the first braid border. Cleanne added the blue and gold checkerboard, and Karen added the rest. I completed it with quilting and the purple binding. Mini Take Two. The colors don’t show quite right on my computer. The “Take Two” refers to the outside corner blocks. I’d started this quilt months ago and wasn’t happy with how the corners resolved, so I changed them. I added a touch of embroidery to the center. This was a fun challenge. I enjoyed working in the small scale, though I wouldn’t say I am very good at it. Still, I like both of my quilts and am glad to have another token of friendship from my small group members. 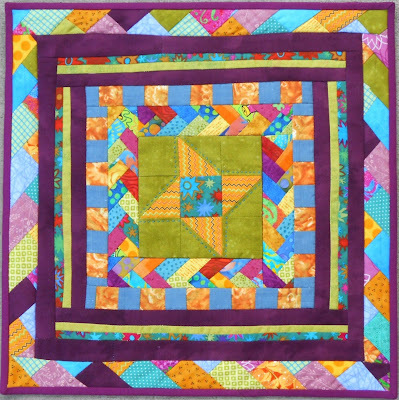 This entry was posted in Creativity, Quilting, Quilts and tagged Center medallion, Challenges, Creativity, Design-As-You-Go, Fun, Medallion quilts, miniature, Miniature quilts, Quilt guild, Round robin on August 5, 2014 by Melanie McNeil.